Sangha member Deborah Stevenson has a longtime practice and is also an accomplished painter. I asked her to talk about the relationship of her Buddhist practice and her creative work. Here’s what she wrote. I was first introduced to meditation in 1972 in a mini college class for freshmen called Introduction to Awareness. Hey, it was the 70s! So we got a sampling of yoga, meditation, and poetry. In 1974, I took a leave of absence from college to do an intensive meditation study with an Indian guru in Los Angeles. Ironically, Naropa Institute was getting its start at this time so maybe I should have stayed in Colorado. I practiced meditation off and on for twenty years without benefit of any further instruction or a community from which to draw strength. While working in the Four Corners area, I found some books by Jack Kornfield and Thich Nhat Hanh in the Moab library. This was my first introduction to Buddhist psychology. When I came to Nevada in 2004, Penny Fairfield told me about the Monday night sitting group. I tried it and then invited my son Charlie because I thought meditation might help him. I came to meditation mostly for Charlie, but it helped me too; in fact, we went on a few retreats together at Washoe Pines. Then Christy Tews told Charlie about a job opening in information technology at Insight Meditation Society (IMS) in Barre, MA. Charlie applied and has been working at IMS, in close contact with Joseph Goldstein and all the greats, ever since. Never underestimate the value of community! There is no separation between Buddhism and art and ultimately, between Buddhism and life or art and life. My art is a reflection of my core spiritual values. My highest aspiration is that my inner life and outer life be seamless. It is all timeless awareness. Of course, I still have a lot of work to do. That is why it’s called practice. 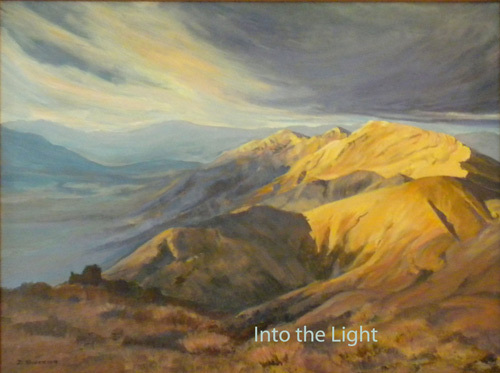 I chose Death Valley as the subject for my landscape because it best expresses the qualities of spaciousness and light. When I meditate, especially if I can achieve a high level of concentration, I touch a place of peace, light, spaciousness. On two separate retreats at Camp Galilee, one with John Travis and one with Shaila Catherine, I experienced a brief moment when I felt as if a trap door opened beneath me; the bottom dropped out and all I saw was space. I’ve always had some anxiety about groundlessness, but in these instances, there was a great sense of peace, as if I were being held in the arms of love. I aspire to carry a bit of that peace and silence into my life and work. On the surface, life is stormy and chaotic, but underneath it is still and quiet like the vast desert seen from a mountaintop. I know this is true because I have experienced it: there is a tranquility, a sweetness, a deep calm-abiding that one can sense in the desert and also at Lake Tahoe. It is palpable. Between the choppy waters and the rocky bottom, one finds stillness, momentary nibbana. Ah! Ego does not make great art. Ego worries about what other people think. Ego is judgmental and afraid. When you let go of THE SELF, or at least see through it, embodied presence comes through. Art and awareness are one. Touch, feel. Feel, touch. Just this. The natural state is oneness. No effort. The best art comes out of the silence. Buddhism, art, life—no separation. art, buddhism, sangha members. Bookmark.